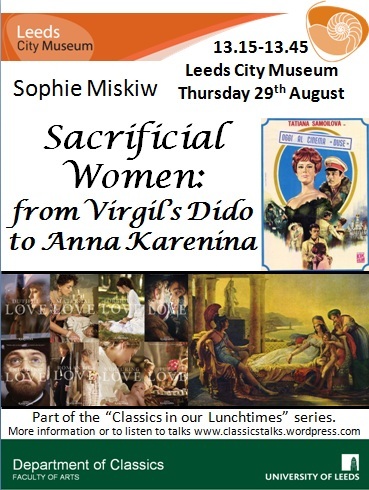 Originally scheduled for – 13:15-13:45, 29th August 2013, Leeds City Museum, this talk has had to be postponed until further notice due to unforeseen circumstances. We apologise for any inconvenience caused. A substitute talk is being offered. We hope to hear from Sophie during the next series. Sofie Miskiw presents her research into the role of women in literary tellings of history, particularly of “the history that shaped a nation”. She reveals a number of parallels between Virgil’s Dido and Tolstoy’s Anna Karenina and explores their significance. For the precise location within the Museum, please see posters or ask on arrival.